Deanna | Sam L. Amirante & Associates P.C. After three day jury trial, client was found NOT GUILTY of driving under the influence, driving with more than .08 blood alcohol and failure to reduce speed to avoid an accident. 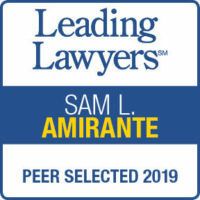 Attorney Sam L. Amirante proved the state did not have enough evidence to arrest the defendant and the State could not prove their case beyond a reasonable doubt.